More than 800 athletes from across Iowa will be competing in the Special Olympics Iowa State Bowling Tournament on Nov. 21. The tournament will span three locations – Westdale Bowl in Cedar Rapids, Bowlerama in Des Moines and Plaza Lanes in Sioux City. 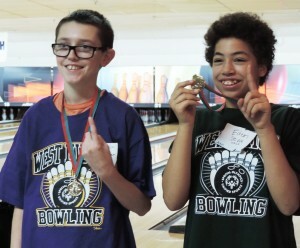 Athletes of all ages will compete in singles, doubles and four-person team bowling. Bowing is also offered as a Unified sport in doubles and four-person team, where athletes with intellectual disabilities are paired with athletes without disabilities. Ramp bowling is available for athletes who are unable to roll their own bowling ball. 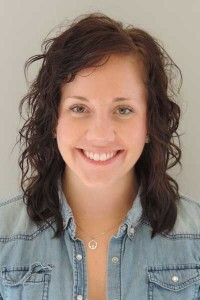 Erin Birkenholtz has joined the Special Olympics Iowa state office staff as the Director of Regional Field Services for the Southeast Region. She will oversee the East, East Central and Southeast Areas for SOIA. 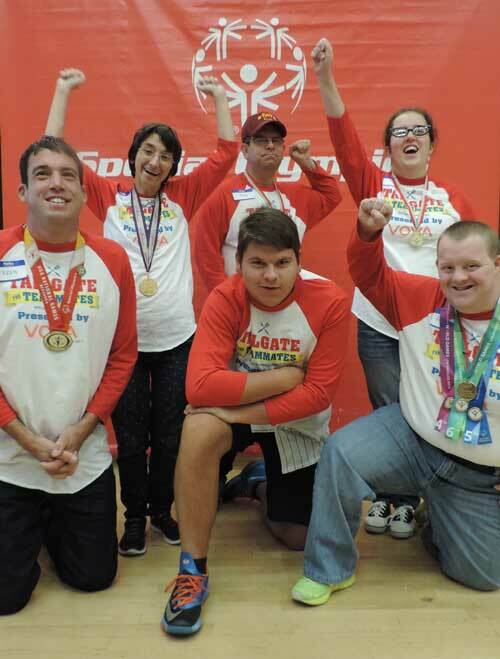 Birkenholtz has an extensive Special Olympics background, having been a part of Summer Games, Winter Games, Mid-Winter Tournament and Play Days. In addition, she has been responsible for the creation and execution of various fund raising events and program events for SOIA. She is a graduate of the University of Iowa, where she received her bachelor of science in leisure studies with a therapeutic recreation emphasis. She has most recently been employed by the ARC of East Central Iowa where she supervised, coached and mentored direct service providers, and worked with over 90 individuals and their families in delivering care and instruction to clients. She is looking forward to engaging with all of our athletes, families and volunteers in the Southeast Region. Please join us in welcoming her to our Special Olympics Iowa family! 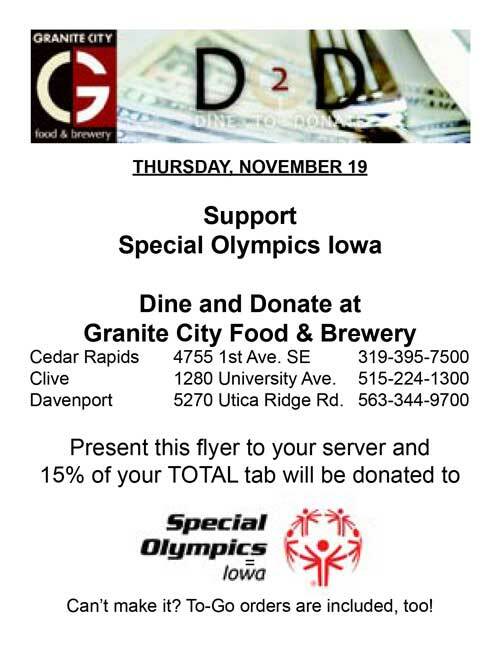 Granite City will be donating a portion of its sales to Special Olympics Iowa on Nov. 19! 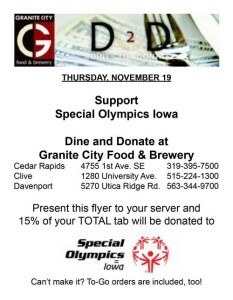 Visit one of the three Granite City locations in Iowa – Cedar Rapids, Clive and Davenport – on Nov. 19, show your server our flyer and 15% of your total tab will be donated to Special Olympics Iowa! Can’t stay for a meal? To go orders are included, too! Thanks to YOU, Casey’s General Store donated more than $34,000 to SOIA from this year’s Casey’s Cup campaign! Between Memorial Day and Labor Day, SOIA athletes and law enforcement officers were featured on the 44-oz. cups, with a portion of the sales going to SOIA. Casey’s and SOIA also challenged customers to a photo contest, taking photos of themselves with the cups and posting them on social media with one winner each week receiving a free Casey’s pizza. Jessica Clements, an SOIA athlete from Fairfield, was the grand prize winner and received a year’s supply of free Casey’s pizza and a one-night stay with four waterpark passes to the Ramada Tropics Resort in Des Moines. Nothing brings fans together like a good old-fashioned tailgate! The first annual Tailgate for Teammates presented by Voya was held Oct. 17 at the State Historical Building in downtown Des Moines. Sponosrs and guests helped SOIA reach its $50,000 fundraising goal. Athletes mingled with guests as they autographed trading cards with their photo. We Are Iowa Local 5 News Anchor Elias Johnson emcee’d the event along with SOIA athlete Tyler Leech, entertaining the crowd. LSB Branch Manager Derek Baker with SOIA athletes at the Banking 101 lesson. Lincoln Savings Bank (LSB) hosted a class for Special Olympics Iowa athletes at its bank in Clive as part of the students’ Senior Plus Program at Valley High School. The class is for special needs students who have earned all their credits to graduate, but choose to stay in school longer to have access to lessons on living and vocational skills. Derek Baker, LSB branch manager, spoke with the students about the importance of paying yourself first, the difference between checking and savings accounts, and establishing good credit. Baker explained that when paying yourself first, you should put some of your paycheck or birthday money into a savings account before buying the things you may want. Putting away 10% of your paycheck is a good number to start. Doing this can help you learn to manage your money better, save toward a goal or have money for emergencies. Special Olympics Iowa (SOIA) is proud to announce Lincoln Savings Bank as its newest Statewide Partner. With a gift of $25,000, Lincoln Savings Bank will be a Premier Statewide Partner for SOIA, after agreeing to become the Presenting Sponsor of the West Des Moines and Cedar Falls/Waterloo Polar Plunges. Spirit Lake High School embodied the spirit of inclusion as Special Olympics Iowa athlete Megan Vierkant was crowned its 2015 Homecoming Queen on Sept. 23. Megan was nominated as one of five senior girls up for the honor. When her name was called as one of the nominees she was a bit surprised, but her surprise quickly turned to excitement as she jumped up from the bleachers and ran to join the other candidates as the gym exploded with cheers. 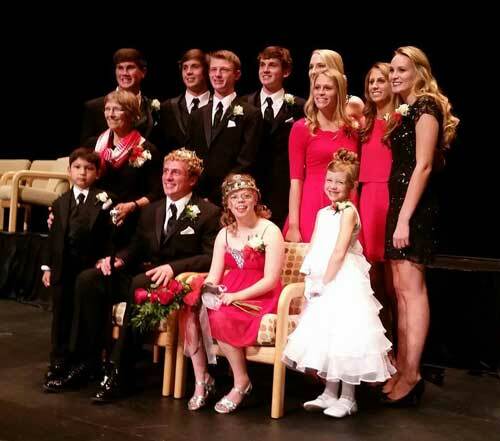 The student body of 450 freshman through seniors voted to decide who would be their queen, and when Megan’s name was called once again, she was overwhelmed with support. The roar of the crowd, tears of joy and endless applause were only overshadowed by the support she was shown from the rest of the Homecoming Court. Megan’s royal reign continued through the week, participating in pep rallies at the elementary school, middle school and high school. She got her first ride in a convertible during the homecoming parade before proudly walking with her parents to be introduced to the cheering crowd at the big game. 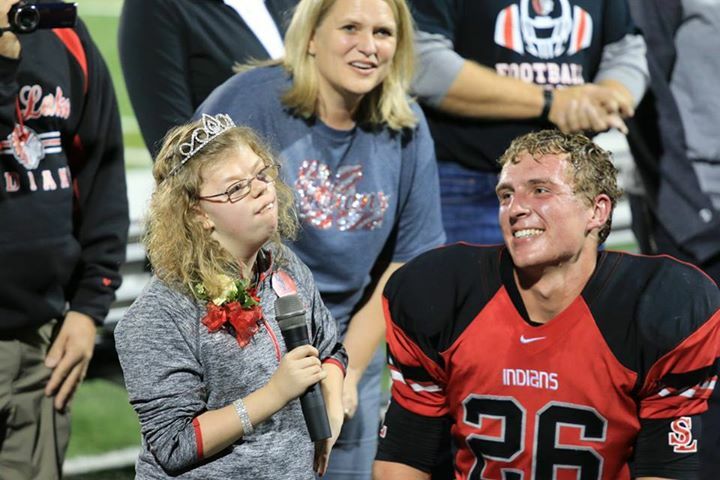 The king and queen each gave a short speech at the game, where Megan thanked everyone for supporting her in getting her crown. It’s easy to support someone as inspiring as Megan. She is a member of the marching band, concert band and concert choir at school. She also delivers Meals on Wheels several times a month, with several clients who wait for her day to deliver her meals. As a Special Olympics athlete, Megan has become an ambassador for the Unified Sports program. She plays unified golf and always recruits one of her peers from school to be her partner, incorporating other friends to help her train for her non-unified competitions. The training program has become so popular that there is a waiting list of students to come be Special Olympics training partners. 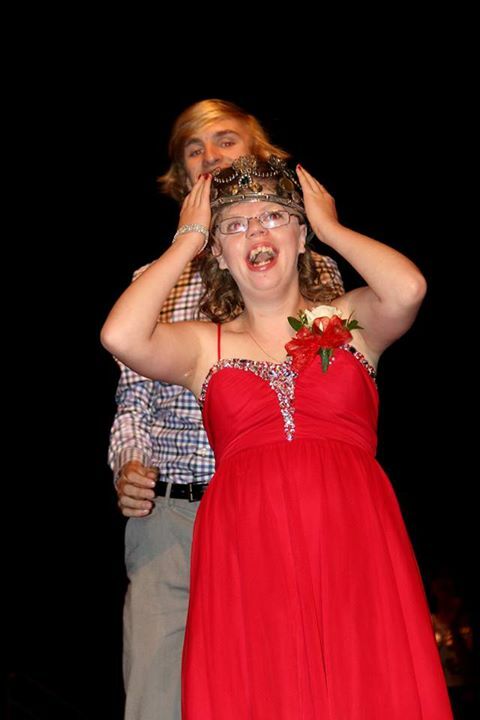 Megan truly personifies how Special Olympics Iowa’s goal of acceptance and inclusion can truly benefit the entire community. We couldn’t be more proud of Megan and the students at Spirit Lake! After more than 63,260 total online votes were cast, Special Olympics Iowa (SOIA), based in the Des Moines area, was proclaimed the winner of the 10th annual Make My Non-Profit Run Better contest. Representatives from Premier, a leading provider of copiers, printers, networks, managed print services and pure drinking water systems, announced on WOI-TV this morning that Special Olympics Iowa – a non-profit that provides year-round sports training and competition for children and adults with intellectual disabilities – is the grand prize winner of a $15,000 office technology makeover. 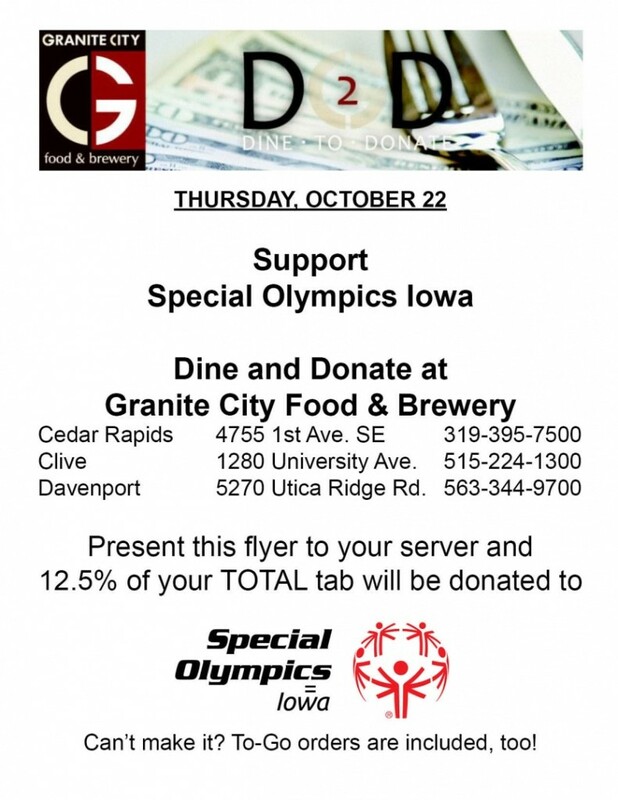 Granite City will be donating a portion of its sales to Special Olympics Iowa on Oct. 22! 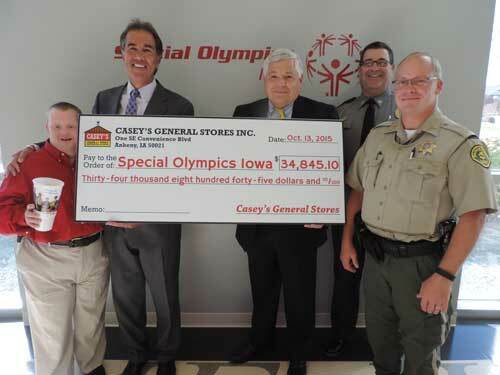 Visit one of the three Granite City locations in Iowa – Cedar Rapids, Clive and Davenport – on Oct. 22, show your server our flyer and 12.5% of your total tab will be donated to Special Olympics Iowa!